Even if the layoffs are NOT true, ask yourself a few questions. Did you see Apple’s DVD Studio Pro get any real update in Final Cut Studio 3? No. Did you see Apple’s DVD Studio Pro get any real update in Final Cut Studio 2? No. 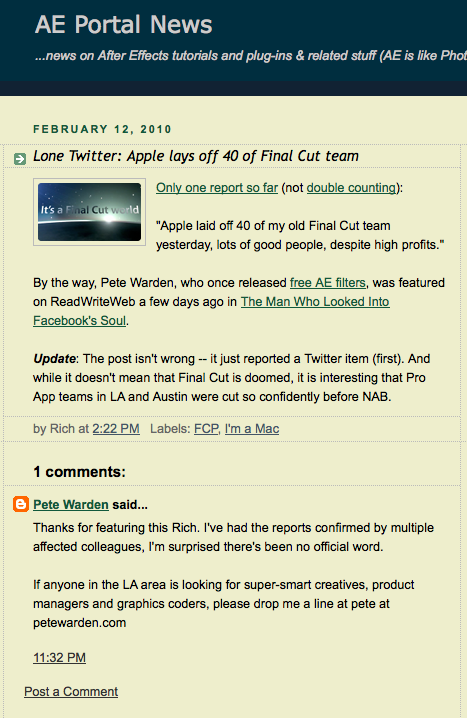 Did Apple make LiveType go away in Final Cut Studio 3? Yes. Can they make any of their other apps go away if not profitable enough? Yes. Have you seen desktop computers, like the Mac Pro, heralded as one of the company’s profit centers in the last decade? No. It is laptops, phones and pods. Has Apple even removed “Computer” from their name? Yes. Do you want to keep investing in a company that has not, for quite some time, demonstrated a clear driving ambition to provide the latest and most powerful tools for you to use? Basic sales will tell you it’s far more profitable to sell a small widget to 1,000,000 people than it is to sell one great thing to 1000 people. And Apple has sold more than three BILLION apps, millions of phones, multi-millions of iPods. And tens of thousands of Mac Pros. Apple doesn’t go to NAB any more. Apple doesn’t even go to Macworld any more. They are marketing direct to the public and have both the market and mindshare that gives them the tens of billions of dollars they never had with just computers. As a Mac user, it sort of pains me to realize this, but I will likely have to leave behind the platform that I cut teeth on in the digital video age. Adobe is pushing limits: offering real Blu-ray authoring, developing new technologies like built-in transcription, print video to PDF for client review and time-stamped notes. Sony Vegas offers true 4k (i.e. RED) video editing in the timeline— something that Final Cut Pro and QuickTime still can’t do for real. They can’t handle the pixel dimensions that big. Companies are announcing and building hardware, cameras monitors and more that all do 3D. The Hollywood Post Alliance is dedicating their 2010 session to it. Blu-ray players that can play it are already on the way and 3D blu-ray disks are already on shelves. We’ll get clients asking for it. How long will it be before Apple decides to update their Pro tools to handle what everyone else is already shooting, editing and delivering? It’s already years too long for blu-ray. 64-bit, core i7 machines, Adobe’s new Mercury video engine looks to make AVCHD as easy to edit as DV. These are technologies and companies reaching far forward to make my job easier, faster and better. I want to put my business money on the horse that’s running harder, faster than the others- trying to win the race that I am involved in: video production. I don’t want to put my money on the one that’s far more interested in the flowers outside the track. Oh, Apple today released that they have sold their 10 BILLIONTH song on iTunes. Even if Apple only made on penny per track (they make a lot more) that’s still several TIMES their income from computers.